Superliga is a multi-genre RPG based on a bespoke d20 system. Superliga will see you characters exploring genre mashups: fight Knights with AK-47s, solve crime dramas with a magical axe, see off dragons in a mecha. This review concentrates on the main rulebook, which does a good job of setting down an ethos for the game. This is the second time I have cast a beady eye across it - the first time was to suggest some improvements to the layout (all of which have been implemented). The style is friendly, chatting and light hearted. Superliga is written as if talking straight to the Overseer (GM) and suggests (with some light hearted winking, nudging jokery) that the GM is at war with the players. I, like Brendan, appreciate this is not the case with most roleplaying groups but I for one spend most Tuesday nights fighting a war on four fronts against minds marinaded in the love sauce of Beelzebub. The rules persistently remind the reader that the Overseer can give out points and overturn results but I would use this sparingly. And I am a megalomaniac. Your character is described by statistics, skills and equipment. Statistics are split into rolled primary statistics and secondary ones, derived through simple mathematics. The primaries are self explanatory: Strength, Constitution, Dexterity, Intellect, Willpower, Magic and Luck. 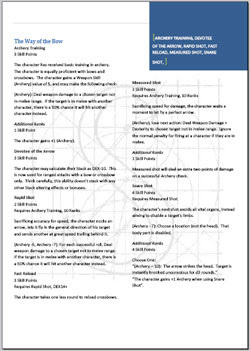 Roll 2D10 and sum for each. If you don't like the numbers, you discard the lot and re-roll (except Luck). Luck is the odd one out as it is used to augment other stats. Secondary statistics: Stack (physique or beefyness), Health, Resilience and Skill Points are calculated from the primary statistics. Skills are broad abilities and a single skill covers a range of different game affects and are bought with points. 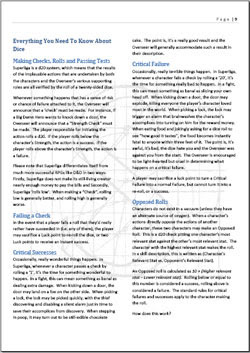 Skill and Stat checks are made using a d20 roll (with critical passes and failures) and opposed rolls use a d20 with adding 10 to the relevant statistic of the person doing the task and then subtracting the relevant statistic of the opposed. This does feel a little odd but does seem to work in the given examples. The skill list is breathtaking in its size and detail. Brendan has opted to cover a range of skills from a variety of genres, including Fantasy and Science fiction. Although you do not get a lot of skills, there is loads to read for each one. They are organised into 'trees' to ensure you can do A before B. The lowest Dexterity goes first, time is split into rounds and a player may do one action per round. To hit someone, you roll the relevant skill, roll for a location to hit. Critical passes do double damage, critical fails mean that there is some sort of fumble. There is crunch sprinkled on how damage affects the character. 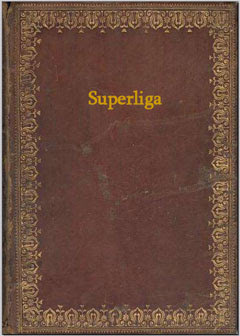 Superliga is a plethora of planes of reality, called Splinters. A Splinter is a genre such as medieval, fantasy, modern, sci fi and so on. Splinters sometimes merge, giving bionic cowboys or vikings with rocket launchers. You can move between the Splinters by using the Etherium, a foggy place. This would suggest travelling to a specific plane isn't very easy. A list of Splinters is given but setting documents are provided separately. There is a sample adventure (hurrah) that gives a good explanation of how a single game is run but not how all these planes stitch together. Superliga is new and online right now. Brendan is over at 1KM1KT as Bryndon and although this doesn't sound too important, it does make a big difference. He's keenly adding and improving Superliga given feedback. Alongside the rulebook is a campaign setting for Ancoria - lavishly put together. Intrigue and Expertise contains even more skills, abilities and optional rules. A Compendium of Marvellous Sights (still in Beta) is a huge companion of things to throw at your players. I mean things in the broadest sense - monsters and people with professions alike. 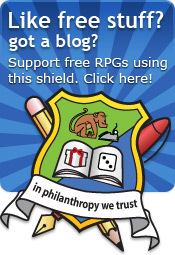 Having an author active in the hobby is extremely important for a free game (well, I would say that, wouldn't I?!). The Superliga system feels like Version One of something truly superb. I'd like to see some of the fluff taken out (it's 122 pages! ), some pictures added in and a reorganisation. I would start with what the characters will get up to and describe the bones of the setting before getting into the mechanics. Introductory pieces to each section to lead the reader through each step and provide quick reference. The system has some clunky moments and could do with some more polish. For example the number of skill points are based on intelligence but if you've ended up with a low intelligence, you won't have many skill points. Instead of using intelligence, you can use other statistics but it limits what skills you can buy. It works but it's not very neat. There are a few places you get this feel of 'nearly done'. It is the setting and resources that makes Superlia super, I'd consider binning the system entirely and use a stock system such as Fudge, Fate, Jags or Yags. If you've downloaded and read a bit of Superliga, you've already climbed aboard the runaway train that Superliga will become. There are screws left to tighten but the core idea is solid as granite. Superliga is doused in passion and the light style of writing draws you in. If you don't need a new system to run, get hold of Superliga and its source books for the sheer density of ideas. So packed it is that it might actually implode on itself. I applaud Brendan for a huge body of work, let's hope he carries on tweaking, improving and sharing. Oh, I'm sure he will... and everytime he does, he'll have his brothers playtest it just to make sure its all down pat. I'm pretty much Chaotic Neutral... so I'm like the unwitting Devil's Advocate. @Borderline Sanity, it's good to hear from an insider. Playtesting will tighten up the figures but I know better than most that what you play and what you write can be very different. The Setting is king here, if you can give Brendan a prod and get him to expand that, it would be fab. Thanks for the comment!